Despite all the pros, open office floor plans aren’t for everyone. Though trends suggest it’s good for Millennials, it doesn’t even work for that entire age group (which covers people born in the 1980s to the 1990s). Consider carefully before you switch your office over! If you are set on an open office plan, we also provide some suggestions to make the transition smooth and your office feel happy. The first thing you’ll lose in an open office is privacy. While this sounds like a great thing for supervisors who want to make sure that their team members are staying on task, it may diminish effectiveness for some. There are employees who thrive with some privacy who, if their walls are removed, will falter and become far less productive. Open floor plans also make some tasks more difficult. For example, if your business requires everyone to make plenty of phone calls through the day, such as in customer service or sales. Phone calls–especially if they’re taking place on top of each other–might be difficult to conduct in a professional manner. Private spaces for business calls in such an environment then become essential. Make sure that if your business requires work like this that you have adequate space to allow everyone to work. Also, try to provide private booths or rooms for phone calls. While having an open floor plan reduces the likelihood that employees will waste time, it also actually increases distractions. The chances go up for employees to get distracted talking to one another. And this can be difficult to enforce, especially since one of the goals of an open-plan office is to increase communication and cooperation. It’s also possible that even a dedicated employee could lose focus. Phone calls and other conversations can divide attention whether or not a person is participating. Annoying little habits become more prominent, which might cause tension or distraction. To stay productive, your employees will have to get creative to shut out distractions. Encourage consideration of others in your office, and enforce your standards. Try holding good communication training to help your employees practice peaceful resolution to issues that might be distracting them. 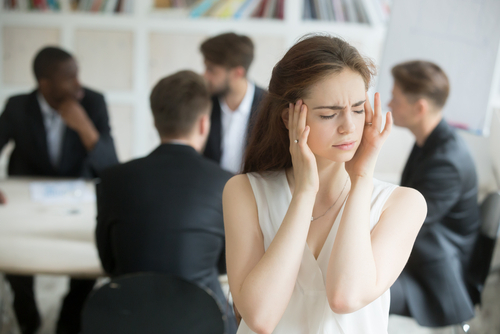 With the decrease in productivity and increase in distractions, your employees will have more stress on their plates. Accomplishing projects may be more difficult, especially within tight deadlines. As with the above example, it might cause problems with placing calls or meeting with clients in a space with little privacy. Plus, there are always those employees who will do better with privacy–both from their peers and from their superiors. These aren’t the ones who goof off; they’re just the ones who do better knuckling down and getting work done. If these are your best team members, knocking down the walls could make working harder for them. If this situation might affect your work space, but you want an open floor plan, consider a hybrid office. You might combine an open plan with separate spaces–not quite cubicles, but something that feels a little more enclosed. Or, give those employees who require a separate space a seating arrangement that better suits their ability to get work done. Flu and cold season can be hard enough to fight as it is! However, open offices make it harder. Without walls to keep germs from coughs and sneezes in, bacteria and viruses spread fast. And while your employees may practice good etiquette by coughing into elbows or tissues, it’s still not as effective as a separate space that can be sanitized. Fight contagion in your office by providing more sick days and encouraging team members with colds to work from home to keep sickness from spreading. Keep the area clean as well, and provide tissues and hand sanitizer. An open floor plan, despite its cons, might still be worth the effort! Are you willing to give this change of scene a try in your business?